A Christmas party in the Riverview Room mean that the IBG'ers were relegated to the Conservatory again (although to be fair, the pub did reserve us the 3 biggest tables in there.) We welcomed another newcomer tonight - Rick from Brentford, who joined us for the first time. It was decided to choose a random deck, which resulted in a rather nasty and cash-poor selection, including the Witch, Militia and Thief, but no Moat to repel the attacks. Unsurprisingly, curses were soon being flung about in great numbers, and this was the first deck to run out. Very few Provinces were bought, and the Cellar and Festival decks soon ran dry too. Philip was the only player to have scraped together enough treasure to make any worthwhile purchases, and won what was a very low-scoring game. The second game was again played with a random selection, but thankfully no Witches this time. Cash was more readily available this time, and Jon had the opportunity to buy a Province as early on as about turn 5 or 6. He decided against this, for fear of clogging up his deck and slowing everything down, instead choosing to take more Gold. By the mid-game, Rick had started to make good use of his Spy, whilst Philip was using his Council Rooms, vast wealth and extra buys to plunder the Victory cards. David was starting to try to use his Remodels to gain Golds and Provinces, but the Province deck ran out before this came to fruition. 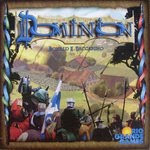 Again, Philip (who has obviously played 1 or 2 games of Dominion before) romped away with the victory. The third and final game saw the introduction of the Gardens, but being another cash-rich game meant that this strategy was unlikely to be viable. The Remodel card was available again, and this time David made good use of it from early on, Remodelling Remodels into Gold, and Golds into Provinces. This worked a treat, and again the Province deck ran out pretty quickly, with David picking up more than his fair share of them. As Rick noted, it was nice to see this strategy work so fluidly, as it certainly helps to prove that there are several paths to victory in this particular game. Ian went first and immediately began by competing with Barrie by building an Orange factory and producing goods. Scott started with a second warehouse purchase and snapped up some of Ian’s goods that were fairly priced. Barrie also went with the factory option and purchased a Brown factory to fully compete with Ian as well; unfortunately Barrie priced his a little higher so the sales took a little longer to start since Ian kept his low and Scott would do so as well. Everyone had picked up the idea, though, and the game moved along smoothly, buying goods and shipping them over to the island. Scott stepped in occasionally to keep the economy from stalling too much, by suggesting that no-one fill up their ships with more than one or two goods at the start as no-one else would be able to afford paying a fair value for them all. Since everyone is in control of how much they charge for their goods and you can’t buy your own goods you need to grab deals and price as competitively as possible. At one point Barrie was warehousing some goods at the top of their possible price, so, as subtlely as he could, Scott refused to do anything on his turn on a couple of occasions, as the only player with goods to buy from was Barrie, and Scott explained that they were far too expensive for his liking. The prices soon came down. Since Barrie and Ian were both producing the same colours, the stock of containers were quickly diminishing. However, theyboth felt that they needed a lot more on their island before they could trigger the end, so for the second half of the game, either of them could produce and end the game at any time. This was worrying for Scott, as the control was out of his hands but he took advantage of the lack of all colours being produced and expanded to have both a white and a black factory and keep the supply of containers going. Ian played a strange tactic toward the end, taking out loans just to buy some of his own goods for the island and keep his portfolio of goods stocked and diverse with one of each colour; once he was happy with what he had, he triggered the end of the game by producing the last of a second colour container. Ian unfortunately had two lots of goods with his most. Usually you can choose which ones to get rid of, but not if they are the dual scoring goods, so in this case Ian had to throw away $50 worth of containers instead of the $20. This was most disappointing for him since he had worked so hard at the end to get those goods worth more. All the players were familiar with the game, so no rules explanation was needed. It was decided to play with the basic set using a random layout. As it transpired the island had an abundance of sheep but little or no wheat (a bit like Wales), which really slowed production throughout the game. Dan got to place his settlement first, but this was of no great advantage as the island was pretty random. In the first quarter of the game Gareth started expanding quickly, building an early city, and Dan began his fledgling road extension scheme. Stuart started collecting development cards and Tonio seemed to be a bit random in his strategy. Maybe this was a ploy to fool the others into thinking he didn’t know what he was doing, who knows? By the mid game, Gareth had increased his development further and took the longest road from Dan, which was kept until the end of the game with his mega 15-piece highway. (Gareth’s love of motorways coming at an early age from living near to Spaghetti Junction in Birmingham). In revenge, the robber was used to great effect by both Dan and Tonio on the early leader Gareth, reducing both his sheep and wood production - resulting in much whining from Gareth… (At this point it should be noted that Tonio donned his Santa hat to distract the other players and also lessen the blow when stealing resources). Dan had gradually increased his sheep production, and by claiming the sheep trade harbour this proved to be a winning strategy. Stuart took the largest army card and also got in the old favourite ‘wood for sheep’ trade (the old ones are the best…) whilst Tonio continued his rather erratic expansion. As is par for the course with Settlers, what a started out as amicable trading at the beginning of the game, slowly deteriorated into a total closure of the market by the end. All this resulted in a tight finish, with Dan claiming victory, closely followed by Gareth (complaining that he’d had one fewer turn than Dan) and Tonio. Scott appeared to have grasped the rules the quickest, and got the game started before Barrie and Ian had tuned in fully. In the first round he managed to shoot out 4 or 5 of the other desperados and keep one of his own alive. The second round was fairly even, but at this point, the role of the dynamite hadn’t been fully understood. Barrie threw in the dynamite early and had 10 seconds shooting as many as he could, also reloading lots to throw Ian and Scott off guard. The 2nd round just went to Scott though. In the third round, things changed and Barrie and Ian knew they had to take Scott out quickly - which they did. He lasted all of 5 seconds before his three guys were dead. Ian racked up the win against Barrie. For the fourth round, all the players were getting to grips with the gameplay but their numeracy skills were failing them. They all stayed alive quite a while, but Ian secured the win for this round too. The fifth round was another evenly matched fight. Ian secured himself a further win but in an attempt to seal the win had unfortunately called Dynamite and placed the wrong value of ammunition tokens on his victim. Ian lost the bonus of 3 gold for winning the round as a penance for his mistake. And when the smoke had cleared, Ian had partly made up for his poor showing in Container, to take the victory by a single point. The Ra tiles started to come out quickly in the first Epoch, so there was a bit of a rush to pick up the goodies. Ian was scooping up Nile tiles like they were going out of fashion, whilst Scott was planning for the long-game, by getting a variety of monuments. Jon picked up a set of civilisation tiles before the Ra track filled up and the Epoch ended. There had been an incredible paucity of Pharaohs revealed, resulting in Jon picking up the 5-point bonus with only a single tile – almost unheard of in Ra. During the second Epoch, Ian again focussed on the Niles and Floods, although also managed to add a nice set of 4 civilisation tiles to his collection. Pharaohs had started to appear now, and Jon decided to keep collecting these to pick up the bonus again. Both Ian and Scott used up their bidding tokens before the Ra track filled up, leaving Jon with a ‘push your luck’ moment at the end of the round. He struck it lucky, and picked up 7 tiles before opting out. In the final Epoch, Scott made a valiant effort to collect the most Pharaohs, and at one stage, he was neck-and-neck with Jon on 6 tiles. By this point, Ian had 9 Nile tiles in front of him, which required only a single Flood to score them. The first one was nabbed by Jon using a God tile, and the second came out with the corresponding disaster tile, so was useless. Ian was outbid on the third and final Flood tile to appear, leaving him (literally) high and dry. Scott had collected 7 of the 8 different monuments, and a single set of 3, but the 8th one refused to reveal itself from the bag. By this time, Jon had also managed to collect 7 of the monuments, along with a couple of Pharaohs, which helped him regain the outright lead in Pharaoh tiles. This time it was Ian who was left on his own at the end of the Epoch, but fortune chose to vomit on his balance sheet again, as the final Ra tile was revealed before any more Floods came out. Scott had collected the highest total on his bidding suns, with Ian having the least, but Jon had racked up enough points over the 3 Epochs to take the win. Tonio and Stuart joined in, but had never played before, so a trial game was set up to explain the rules. Basically the players bet on horses, which then move along a track based on the movement numbers shown on cards and the result of a die roll. In the first trial game Tonio and Stuart tended to bet on the same horses which allowed them to move quicker along the track, but they did have to share the winnings, whereas Gareth went with the strategy of betting on the faster horse, but on his own, which gave him a higher score at the end. Unfortunately we have no idea what went on during this game, but appears to have been a pretty close run thing, with Barrie only snatching the victory from David on a tie-break (most property claim cards). Again, details on what exactly went on are sketchy, but it is known that the disasters showed their face about as often as Father Christmas. This resulted in a shortage in gems, and the need to quickly invent a new unit of currency. Philip appeared to have used his 'Daniel-San' magic to good effect, nicking the victory from the usually cautious David. Barrie came last with an amazing 34 gems! Tonight truly was the night of bizarre card games. This was another one of Gareth’s offerings (which he was “showcasing” in an attempt to sell it to Tonio). The basic idea is that you have a hand of cards in 4 different colours which you use to move 4 bears along a scoring track. The bears start at -1 and can eventually reach +3. Whenever one bear reaches the +3 spot, the round is over and everyone scores points for the coloured cards left in their hands multiplied by the space on the scoring track that the associated coloured bear has reached. It appears that Gareth has played this before a few times, as he used his jokers to end the round (which gives you a large bonus) 3 times running. Jon and Stuart were consistently able to score very few points, which Jon blamed on having multiple “1” cards in his hand. Anyway, Scott and Gareth racked up the points and Gareth came away victorious. And so concluded another fine evening of gaming, with no fewer than 5 games new to Wednesday nights being played. Gareth had brought along a veritable removal-van full of second-hand games to flog, and, complete with accounts book, he made a very passable impression of Del Boy in his prime. He appeared to be doing a roaring trade, which means that his new wife, Steph, should be expecting something very nice in her stocking this year…. Next week will be the last IBG get-together before Christmas, so don’t forget to post on our BGG Guild if you think that you’ll be around.